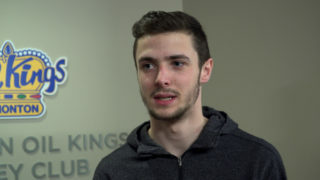 The Edmonton Oil Kings didn’t want to return to Rogers Place in a 3-1 series hole. Thanks to a laudable combination of confidence, assuredness and no-quit attitude they not only picked up a convincing win, but also reminded those watching why they are the reigning champions of the Central Division. 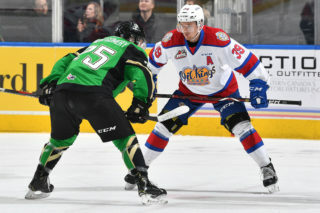 Vince Loschiavo registered a three point night – two goals and an assist – and Todd Scott earned a win in his first WHL playoff start as the Edmonton Oil Kings (2-2) defeated the Medicine Hat Tigers (2-2), 5-1, in front of 2,794 fans at the Canalta Centre on Wednesday night. The best-of-seven Eastern Conference Quarter-Final playoff series is now tied, 2-2, with Game 5 set for Friday, March 29 at 7:00 PM MT at Rogers Place. 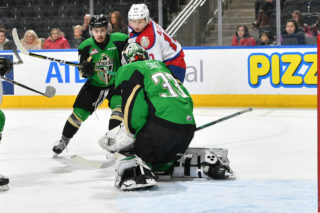 Scott (1-0) was steady when called upon in goal for the Oil Kings, doing well to maintain his focus making 14 saves despite seeing only 15 shots on goal. His counterpart Mads Sogaard (2-2) was exposed by the visitors, allowing five goals on 36 Edmonton shots. 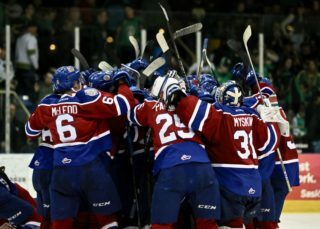 The overage contingent of the Oil Kings showed veteran leadership, combining for four goals and three assists in the game. Matthew Robertson notched a goal and an assist for a multi-point night, while Trey Fix-Wolansky also chalked up a pair of points with two assists in the hard-fought win. After a scoreless first period, it was the Tigers opened the scoring on the power play at 9:34 of the second period. 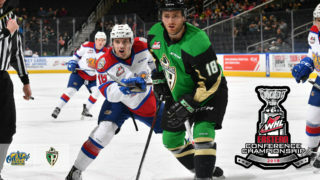 The next power play of the night went to the Oil Kings – their second opportunity with the man advantage – and with two seconds left Benjafield made it a 1-1 game with his second of the postseason, from Conner McDonald and Fyten at 15:32. 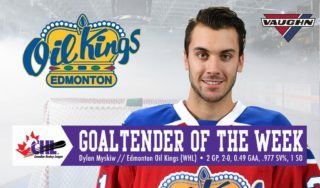 That goal was seemingly just what the doctor ordered for Edmonton, as Fyten tallied his first of the playoffs just 1:13 later to put the Oil Kings out front, 2-1, with the lone assist to Jake Neighbours. But they weren’t done there, as the momentum swing carried with a goal by Loschiavo, his second of the series, from Fix-Wolansky and Robertson after a one-time blast from the point at 17:28. The Oil Kings once again were dominant when it came to shots on goal, holding the Tigers without a shot until near the midway point of the opening frame. Shots on goal favoured the Edmonton 14-5 during the first period of play, and were 23-10 Oil Kings after 40 minutes. Edmonton’s power play executed once again to open the scoring in the third, as Loschiavo notched his second of the night at 7:31, from Benjafield and Fix-Wolansky, to make it a 4-1 Oil Kings lead. To put the icing on the cake, Robertson earned his first ever playoff goal in a way that he – and many others – won’t forget. 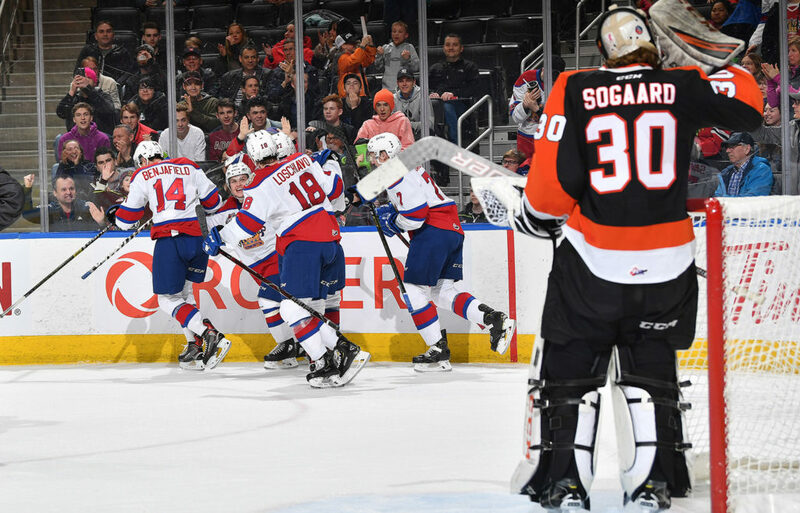 A prototypical dump-in by Robertson on the near side drew Sogaard behind his goal to play the puck beneath the goal line in anticipation, but instead the puck perfectly struck a stanchion and bounced directly into the wide open cage to extend the Oil Kings lead to 5-1 at 11:19, with Loschiavo picking up the lone assist. Final shots on goal were heavily in Edmonton’s favour, 36-15. Medicine Hat was 1-for-5 on the power play, while Edmonton finished the game going 2-for-5 with the man advantage. Ryan Jevne (MH) (3), Quinn Benjafield (EDM) (2), and Vince Loschiavo (EDM) (1) were selected as Three Stars of the Game.